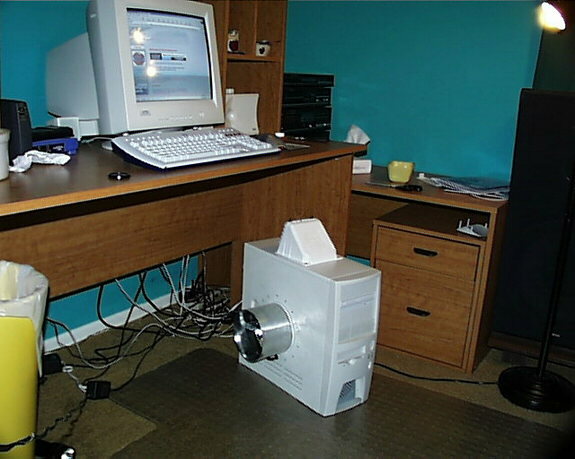 "Forget Mhz, I Want Gigaflops!" Will send pics as soon as get didgital camera!!!!! 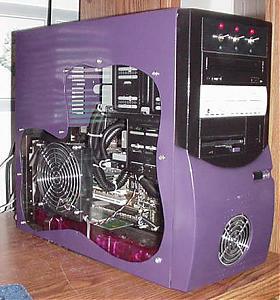 i have that exact AT case in the other room, i built it for my sis but it used to be mine, does it have a little slide on the front to cover everything up? 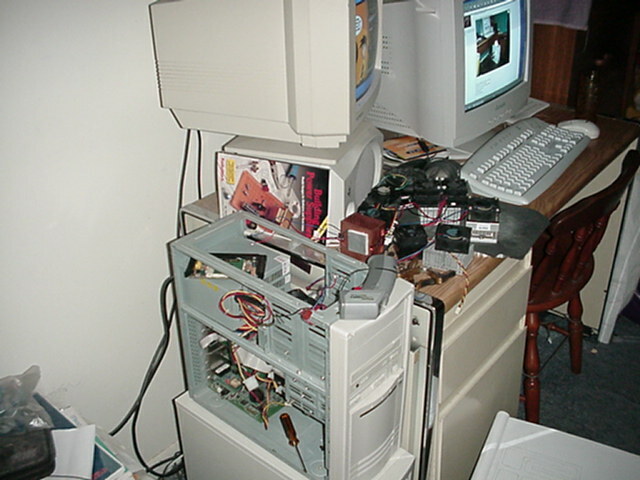 It had a little slidy thingy that covered the drives, but I got Pd-off at it and smashed it with a hammer He he smashy smashy That and removing the single piece lid are the only "modding" I've actually done to it. 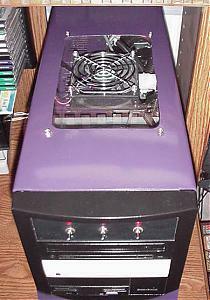 The case that it is sitting on is a darn near virginal Enlight 7237, going to install my watercooling stuff in that one. Arent those sub-wolfers supposed to be kept AWAY from monitors??? That one is shielded and safe to put in close proximety to monitors. but that just isn't any fun! Arent those sub-wolfers supposed to be kept AWAY from monitors????? Had to move my monitor for some reason or another (I *was* setup on the floor) and it changed...so I moved my speakers a bit, and it went away! Heh...teach me not to put gigantice magnets near my CRTs. Hey, -=HN=- Wild9, is that the famous finger-slicing case? Thank you, Time is the operative word here. Last edited by Samuknow; 5th October, 2001 at 04:17 AM. You'se guys's case mods are most interesting, thanks for posting the pics! Is is against the rules for me to post a link to an Australian PC enthusiast's site that has a case mod gallery with some stellar pics? Oh well, it's not a link! Triple dubya dot overclockers.com/au . It's worth the clicks! Samuknow, all I can say is SCHWEEEET dude!!! Dat rocks, keep it up!!! Got any more pics? Last edited by Samuknow; 30th September, 2001 at 05:52 PM. Last edited by Samuknow; 23rd December, 2004 at 11:31 PM. I need a camera!!!!!!!!!!!!!!!!!!!!!!!!!!!!!!!!!!!!!!!!!!!! !!!!!!!!!!!!!!!!!!!!!!!!!!!!!!! I just put a window/ blue light- blowhole and handels on my computer!!!!!!!!!!!!!!!!!!!!!!!!!!!!!!!!! !